Singer-songwriter-multi instrumentalist, charismatic entertainer and blues missionary all combine and shine in Martin’s solo performances and recordings. He is considered one of the leading one man bands, using foot and hand percussion –suitcase bass drum, snare, tambourine and shakers – where appropriate to the arrangement of the song, while playing guitar and rack-harmonica. An acknowledged master of blues guitar and harmonica, he has been studying since the age of 16, and still takes inspiration from new avenues of exploring the great blues heritage.But he writes from his own heart and soul, looking out on his contemporary world with intelligent reflection, rekindling the spirit of classic blues and moving the legacy forward in the most fresh and personal of ways. He has released 3 solo albums which have all been internationally acclaimed, and has performed solo at major festivals clubs and theatres round the globe and jook joints in Mississippi and Memphis. In addition, Volume 1 of his retrospective double album “Blues Took Me by the Hand 2014” reviewed his solo recordings and went straight in at No 1 of the Airplay Direct International Download Radio Charts. 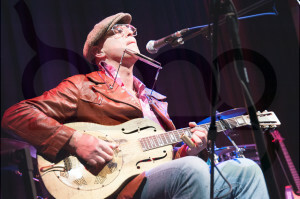 Eddie has won and been nominated for numerous British Blues Awards as Acoustic performer and in 2016 was one of only 4 Finalists in The European Blues Awards for Solo/Acoustic act.